Microsoft has given the first glimpse of Windows 10 on smartphones, including several ways that phone users can stay in sync with their PCs. Despite the new name, the fundamentals of the operating system are similar to Windows Phone 8.1. There’s a vertical list of Live Tiles on the Start screen along with a master app list, and the familiar “Action Center” for notifications still appears when you pull down from the top of the screen. In Windows 10, Microsoft is building on those features, while emphasizing the idea of one experience across phones, tablets, and laptops. This includes giving users a full-blown version of Office, and one system for notifications that syncs across screen sizes. 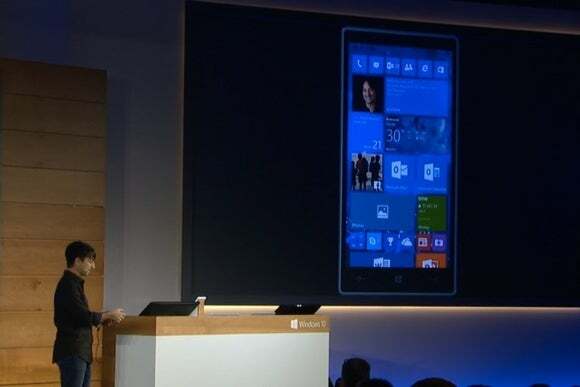 However, Microsoft didn’t show any new hardware, and spent no time talking about third-party apps. Why this matters: Windows Phone has been the underdog in the smartphone wars for years, and shows no signs of regaining its footing. If Microsoft’s smartphone operating system has any chance of survival, it’ll be through deeper hooks into the PC, so it’s no surprise that’s what the company is focusing on with Windows 10. During a press event on Wednesday, Microsoft showed how Notifications will stay in sync between phones, tablets and laptops, so dismissing a notification on one device will cause it to disappear on the others. The company also showed an expanded quick toggles menu with shortcuts to things like quiet hours and GPS, and a streamlined settings menu. While Windows Phone already includes a free version of Office, it’s fairly bare-bones compared to the desktop version. That’ll change in Windows 10, which on smartphones will come with full-featured mobile versions of Word, Excel and PowerPoint. Microsoft has managed to shrink the entire Office ribbon user interface for small screens, making features like Track Changes available on smartphones. Users will be able to beam presentations to larger screens through Miracast and send documents wirelessly to a networked printer. The smartphone version of Office includes all the features ofthe desktop Ribbon interface. 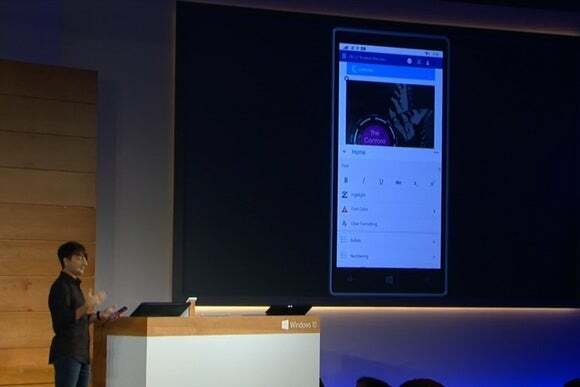 Microsoft also showed off some improvements for typing and voice dictation. By pressing and dragging on the keyboard’s space bar, users can drag a smaller version of the keyboard around the screen, putting it in easier reach for one-handed typing. The keyboard will have a persistent voice dictation button as well, allowing speech-to-text wherever there’s a text entry field. As for messaging, Windows 10 will have Skype built into the default text messaging app, so users can switch between Skype and SMS without switching apps. The Windows 10 smartphone keyboard can move and shrink to make one-handed use easier. Strangely, Microsoft spent no time talking about third-party apps—long seen as Windows Phone’s weak point—though it’s no secret the company hopes to attract more developers through universal apps that work across phones, tablets, and laptops. Microsoft did demonstrate some upcoming universal apps of its own, including a new photo library app (with features like auto-enhance and automatic album creation) and a refreshed Music app that can store songs on OneDrive and sync playlists across devices. As with the PC version of Windows 10, Microsoft plans to launch a preview of the smartphone version ahead of an official launch later this year. The preview should arrive for Windows Insiders in the coming weeks, sometime after the Super Bowl.